The origin of the Margarita is not precisely known. Of the various accounts of its creation, most are centered in Mexico around the 1940’s, and most claim to have named the drink in honor of women named Margarita. However, the more likely scenario, and the one I favor (for obvious reasons) is that the Margarita evolved from the Daisy, a popular cocktail in the United States during the pre-Prohibition era. The Daisy is made from a base spirit such as brandy, whisky, or gin (think brandy Daisy, gin Daisy, etc), citrus juice, and a flavored sweetener. It is not hard to imagine a Daisy made with tequila and Margarita is the Spanish word for daisy. Regardless of its origin, the Margarita is arguably one of the world’s most popular cocktails. 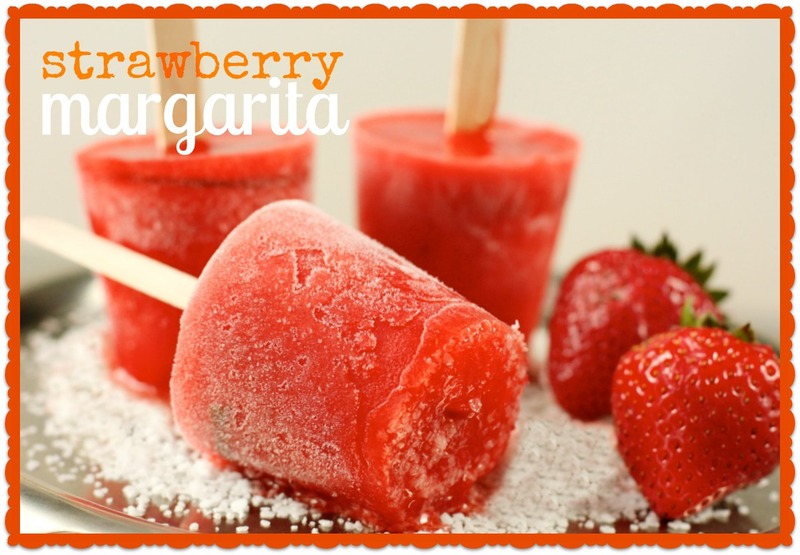 Many variations to the basic margarita use fruit, with strawberry being one of the most popular. Right now, Southern California is in the midst of a heat wave with high temperatures and increasing humidity expected through the weekend and these Strawberry Margarita ice pops are a great way to beat the heat. I made these with fresh strawberries, lime, and Hornitos® Tequila Reposado as a special treat for my husband, Chris, who’s the margarita connoisseur in our family. These have just a hint of tequila and Cointreau, but you can adjust the amount of alcohol to your liking. Just remember that too much alcohol will inhibit the freezing process. Dip the ice pops in a little cocktail salt, if you prefer. Put all the ingredients into a blender except for the simple syrup and purée until smooth. Add simple syrup a little at a time, until desired sweetness is achieved and blend thoroughly. Pour the strawberry mixture into 3-ounce cup molds. Freeze until mixture is slushy, about one hour, before inserting wooden sticks. Partially freezing the mixture will make it easier for the sticks to stay upright and in place. Freeze until completely firm, about 12 hours, or preferably for 24 hours. 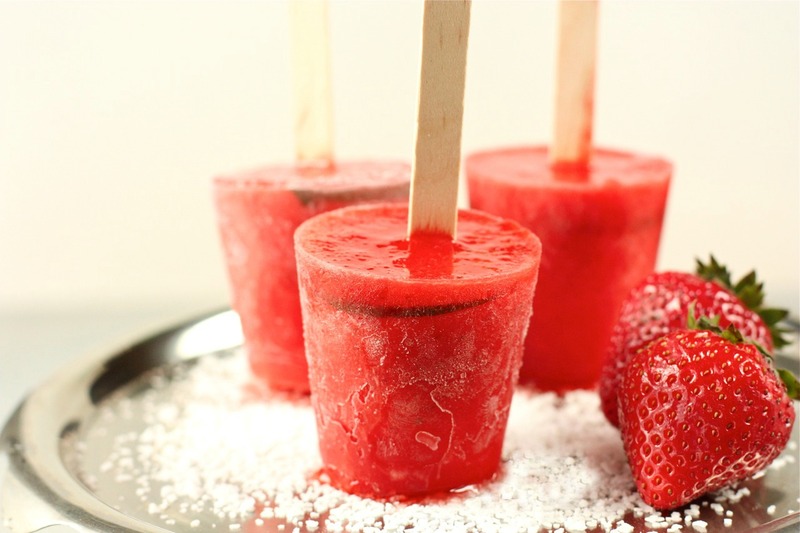 To unmold the ice pops, dip the frozen molds into warm water for a few seconds. Gently pull the stick to release the pops from the mold. Dip the ice pops in margarita salt, if desired. I have a leetle tiny freezer above my leetle tiny European fridge in my leetle tiny fitted kitchen, but all the same I may have to take a leaf from your boozy ice pop book! Do they melt more quickly than regular popsicles because of the alcohol? They took about 24 hours to freeze completely. Once they were frozen, they were fine. Since I kept them on the small side (3 ounces), everyone was able to eat them before they started to melt and drip. Such a beautiful color, Daisy, and I’m sure they are tasty, too. Thanks, Sharyn! This was my husband’s favorite out of all the ice pops. It had a great strawberry flavor with a little kick from the tequila.